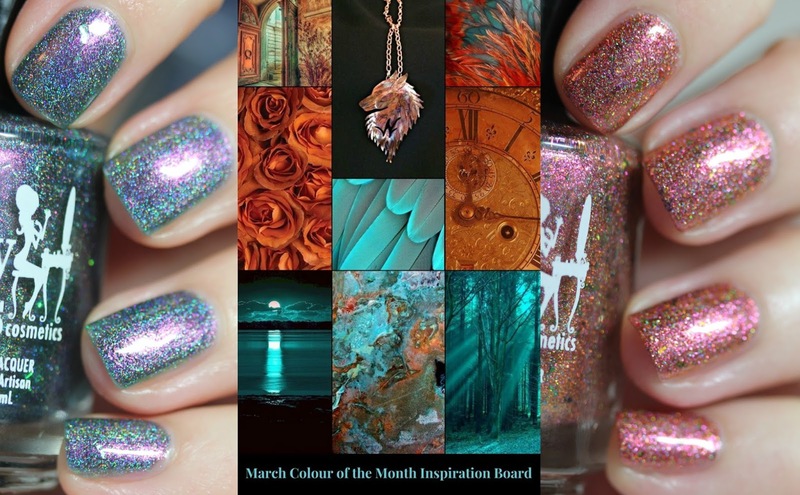 March has come in like a lion and with it comes the March Colours of the Month from Girly Bits Cosmetics! Hip hip hooray! I absolutely love the choices Pam made for March so let's check them out. Both of these polishes are 5-Free, cruelty free and vegan friendly. These will retail for $16.50 each or grab them both for $31 through March 10th in the Early Bird Listing. After that, they will continue to be available for purchase individually for $16.50 until May 1, 2018. Girly Bits I Shift You Not is a soft teal blue base with intense copper to gold to green shifting shimmer, holographic pigment, and iridescent shifting flakes in green-pink-violet. I am wearing three coats plus top coat. The formula is sheer but it builds up perfectly and each coat dries very quickly. I used the top coat to bring back the shine but otherwise the formula is super smooth and everything lays flat as it's flakes not glitter. This nail polish has at least three distinct faces: purple, green and blue. And teal at other angles. So, at least four! 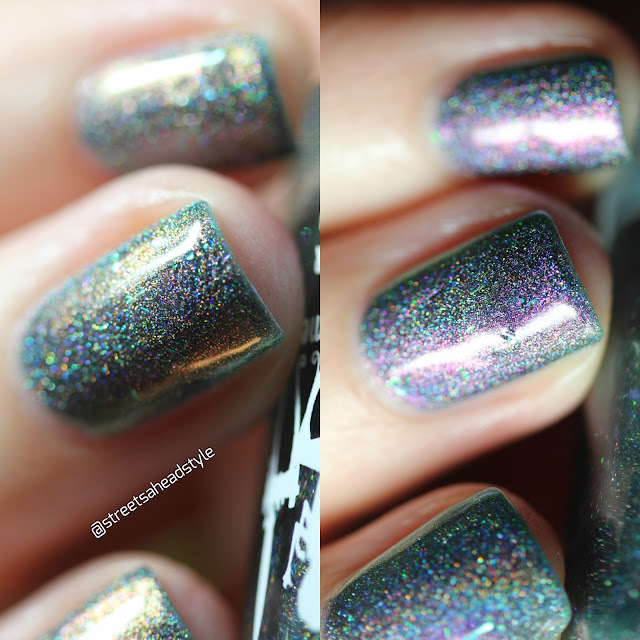 It's absolutely beautiful and I can't wait to see this baby out in the sun - it's going to be blinding with that holo! Oh baby! Girly Bits 29 & Holding is a flaming copper/pink/violet scattered holo, with intense red/orange shimmer, and multi-chrome flakes in green/pink/gold. I am wearing two coats plus top coat for this one. It builds up so well after the first coat and it's also very smooth once you apply top coat. The flakes in here are so much fun and I love the contrast with the base. The finish on this almost feels metallic in some lights which is really cool. I love these shades because I never think I will like them and end up loving them on the nail. It's such an unexpected mix of colours and it works beautifully. Early Bird Special: Pick up the duo from the Duo Early Bird Promo listing at a discounted price of $1.00 off each bottle from the 1st until the 10th. After that, they will continue to be available for purchase individually for $16.50 until May 1, 2018.